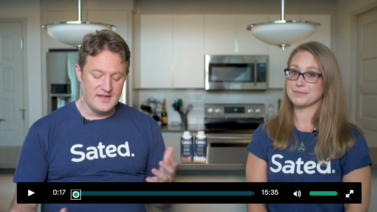 In case you missed it, we’re pre-lauching Sated Ready to Drink Keto Shakes on Kickstarter this month! Kickstarter is a funding platform for creative and innovative projects that are brought to life by the support of others! When you support a Kickstarter campaign, you get to be one of the first to get behind a product AND receive exclusive discounts before it comes to the market. While some projects on Kickstarter don’t come to fruition, Sated Ready to Drink is happening. We’ve been working countless hours to finalize a recipe that’s as tasty and nutritious as our current shakes and have a world class production team ready to bring our product to life! Due to longer production timelines associated with Ready to Drink products, we’re using Kickstarter as a pre-sale platform to better inform us on how much we need to order. Our ultimate goal is to get you your keto meal shakes on time and to continually deliver excellent customer service. Plus, we’re really excited to offer substantial discounts that’ll only be available during our Kickstarter campaign! Stay tuned for the best deals during our early bird sale coming this month! And as always, we’ll have 100% money back guarantee during our campaign and beyond! Words cannot describe how excited we are to show you what we’ve been working on. Thank you for all of the support! The Sated team are great and a keto RTD, wow. Can’t wait to see what this is like.